In Luke's vivid narrative, Jesus comes into Galilee proclaiming "good news to the poor . . . freedom for the prisoners and recovery of sight for the blind." More than any other Gospel, the Gospel of Luke shows Jesus' great concern for the downtrodden, the oppressed and the marginalized--including women and children and even those outside the house of Israel. 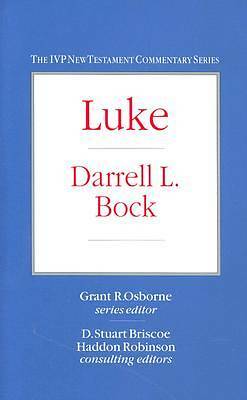 Darrell Bock's IVP New Testament Commentary shows why Luke's Gospel is "tailor-made" for the world we live in--a world often divided along ethnic, religious, economic and political lines. After all, the Jesus portrayed by Luke is a source of unity for his disciples and for believers from every walk of life. Tax collectors, Roman soldiers, prostitutes, city officials, religious leaders, widows and fishermen were among the diverse group brought together in the early Christian church. "The Gospel is universal in its perspective and cosmic in its scope," Bock writes. "As we look at our modern multicultural world, . . . certainly there is relevance in a Gospel that highlights how men and women of different ethnic origins can be transformed into a unified community." Along with a passage-by-passage exposition of Luke, Bock offers background information on date, destination, purpose, form and theological themes in the text. His dual focus on understanding what Luke wanted to communicate to his original readers and on discovering how that message is relevant for today's readers will make this commentary an excellent resource for all who study, preach or teach the Scriptures.